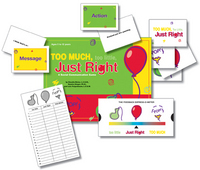 By playing this game, children (ages 5-12 years) learn to pay attention to tone of voice, observe body language, and note how these cues affect the message. Players deliver brief messages and get immediate feedback. They learn to adjust volume, expression, gestures, and other physical cues in order to communicate effectively. Game can be played in a 20- to 30-minute time period by 2 to 8 players. Contents: Leader's Guide, Message Cards, Action Cards, Too Much/Too Little/Just Right Cards, Reward Chips, Response Records & Feedback Express-O-Meter.